I've always used sticky Industrial Strength Velcro to affix my pedals to my pedalboard. And it's always bugged me that I might be seriously depreciating the future value of my pedals with Velcro gummed to the bottom, covering serial numbers, country of manufacture and useful 'avoid exposing unit to excessive moisture'-type information. 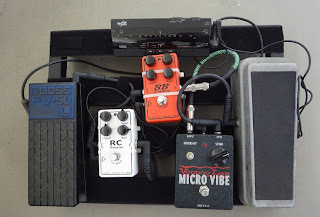 Scouring the net for anything I could find on 'attaching pedals without Velcro' yielded one dude who used individual bicycle chain links, attaching one eyelet to the pedal baseplate and screwing the other eyelet down to the woodbase of the pedalboard. An elegant solution by itself, and certainly rock-solid. But I was looking for something a little more simple that would allow me to swap out pedals in a couple of minutes instead of a couple of hours. Not to mention that the aforementioned method would be well nigh near impossible on the aluminum base of my Pedaltrain pedalboard. Well, maybe not impossible. But well beyond my limited metalwork machining skills. But necessity, as the say, is the Mother of Invention. 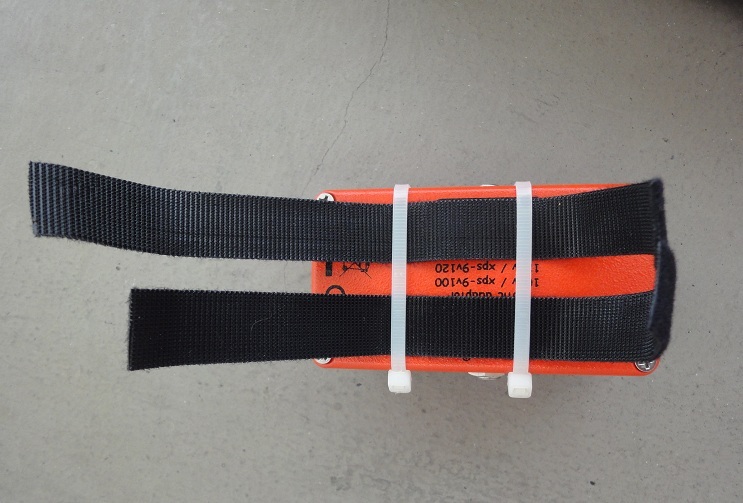 And since idle hands are also the devil's workshop, here's what I came up with, using plastic cable ties and Velcro One-Wrap -- Velcro straps of the non-adhesive variety. I first wrapped two cable ties around the pedal, in this case a BB Preamp by Xotic, one before the footswitch and one in between the control knobs. Doing this ensures that the cable ties will never slip out from the pedal. I then got out the Velcro One-Wrap straps, cut them to an appropriate length, and simply threaded them through the cable ties at the back of the pedal. After deciding on where the pedal would be placed on the 'board, I wrapped the Velcro straps tightly around the appropriate aluminum strip. 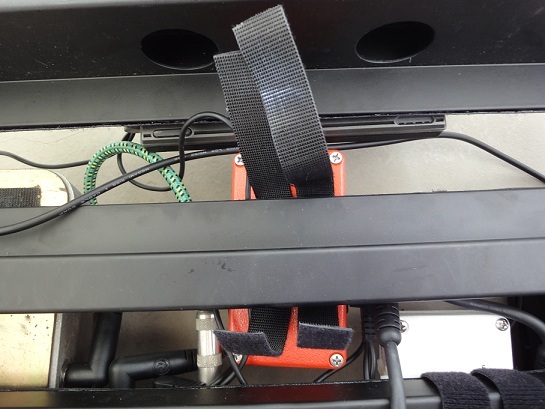 The pedal mounted reasonably securely but with some side-to-side movement. After torquing the cable ties a bit more with pliers and tightening the Velcro wrap further, I found the pedal was as solidly mounted as I needed it to be. The last pic shows the final pedalboard assembly with both the BB Preamp and RC Booster given the same cable tie and Velcro wraparound treatment. 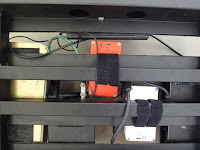 My Voodoolab RotoVibe, RMC wah and Boss volume pedal already have sticky Velcro I attached years ago to their baseplates so they are mounted to the Pedaltrain in the usual way. Go ahead and try this at home, folks! And here's my earlier review of the Pedaltrain Jr. pedalboard. That's a great idea! Let me go try it out.